21 Textbände, einschließlich 4 Supplementbände, 12 Tafelbände, einschließlich 1 Supplementband, sowie 2 Registerbände. Nur Gesamtabnahme. 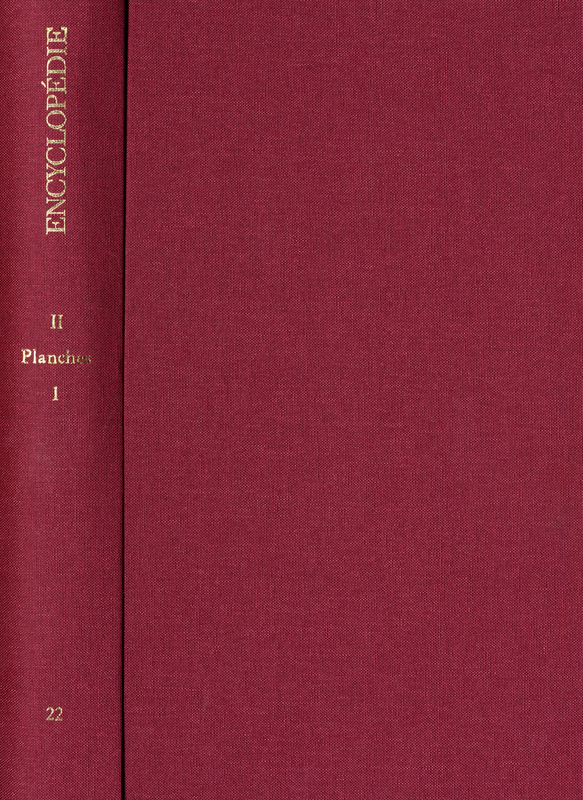 The ›Encyclopédie‹ by Denis Diderot and his friend Jean-Baptiste le Rond d’Alembert is the lexicographical masterpiece of the Enlightenment and is thus an outstanding expression of its time. As the editor of this French encyclopedia, Denis Diderot implemented the courageous idea of recording all the knowledge in the world at that time, and did so, with the help of his successors, in 25 volumes. His goal was to gather the knowledge which up to that point had been scattered, mostly passed down by word of mouth or had been dominated by the church and to make this available. Diderot had to defend his Encyclopédie against the church’s attempts at censorship during his entire lifetime. He did however have the support of many famous benefactors, which meant that the Encyclopédie was able to be completed by Diderot’s successors in 1772, and five supplementary volumes as well as two index volumes had been published by 1780. Today as well, in the age of the Internet and almost excessive knowledge, the Encyclopédie exudes a charm which certainly arose from the idea but mainly from its special implementation. Diderot gathered craftsmen, theologians, writers and numerous scientists from various disciplines and from all of Europe around him and thus had a comprehensive selection of topics. This becomes apparent when looking at the plates. These are elaborate copperplate engravings which for example take into account the very detailed knowledge of the human body which was already available at that time. It was not only anatomy but also craftsmanship, physics and astronomy, architecture, geography and mathematics that were included in the Encyclopédie. As the author of the articles, Diderot was able to enlist famous people such as Rousseau, Voltaire, Holbach, Montesquieu and Concordet for this work. Diderot aspired to present not only the knowledge of the middle classes and craftsmen seen from the perspective of reason but also to show the system of organization behind it. The perspective, mainly that of natural sciences, can be explained primarily by the fact that Diderot knew how to create an antithesis to the idea of God, which he rejected. The Encyclopédie has epochal significance, since it can be seen as a summary of the Enlightenment. It is an indispensable source for studying the history of all fields of knowledge and as a document of the Enlightenment it is a first-rate witness to the history of ideas. At the same time, the Encyclopédie can be seen as a precursor to Wikipedia and Co., which makes it relevant today.